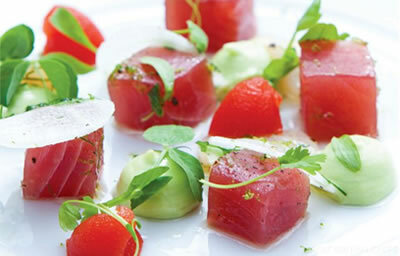 Superfrozen tuna is kept fresher than fresh quality while in super freezers kept at -76°F. Once it’s stored in conventional freezers (at -4°F), we recommend that it’s consumed within 7 days. Line a stainless steel or a glass container with paper towel (to catch excess moisture)..
Open the pouch to take out the tuna. Place the tuna in the prepared container and seal the container with some plastic wrap to prevent the tuna from drying out. Defrost in the refrigerator for about 12 hours. Tuna can be used even if it is half defrosted. Scrape the surface of the Tuna clean on top and bottom with back side of knife for any debris. Put the tuna still in its vacuum pouch in a bowl and place the bowl under a warm running water (80°F) for 5 minutes on each side totaling 10 minutes. Please do not let the tuna come into a direct contact with water. Please do not keep defrosting under the running water for too long. Line a stainless steel or a glass container with paper towel (to catch excess moisture). Remove the bowl from the running water as soon as the surface of tuna starts to turn red. Open the pouch to take out the tuna. Wipe off excess moisture on the surface of the tuna with a piece of paper towel. Continue to defrost in the refrigerator for about 12 hours. Handle and store defrosted tuna as you would fresh tuna. It should be placed in a lined stainless steel or glass container sealed with plastic wrap, and kept in the refrigerator. Tuna can be kept in regular freezer up to 7 days while still frozen. DO NOT REFREEZE. This will effect the color and overall quality of tuna.